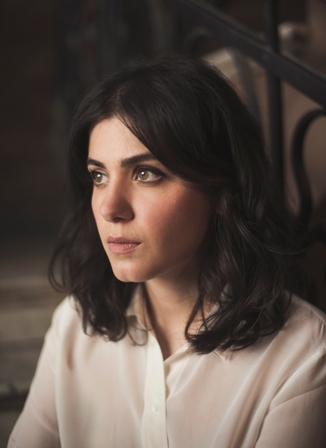 Katie Melua's UK tour, which visits Birmingham Symphony Hall on December 1, 2016, is set to be extra special for the 32-year-old singer. 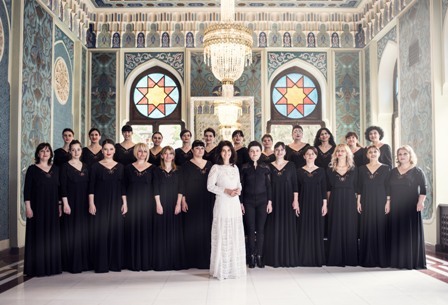 Georgian-born Katie will be joined on stage by Gori Women's Choir, to perform all of her new album, In Winter, as well as some of her classic songs. Founded in 1970 at Gori's School of Music, the 24-piece choir specialise in the ancient Georgian tradition of polyphonic singing. Katie was born in the Georgian city of Kutaisi and grew up in the seaside town of Batumi before moving to Belfast at the age of nine. She decided to record her new album with the choir after hearing one of their recordings in 2014. "I was mesmerised by their tone and sonic richness,'' she says. ''They are essentially a vocal orchestra. The last 18 months of working with them in Georgia has been so inspiring. I am immensely looking forward to performing with them across the UK and Europe this winter. "I've been asked a fair few times why I chose to write around the theme of winter for this album, and, truthfully, the idea came from a conversation I was having with a friend of mine a few winters' ago. We were both lamenting the fact that there didn't seem to be a go-to album out there for us to listen to during the winter months – an album that would fill the house with wonderful, warm, poignant sounds rather than the usual jingle-bells pop songs that tend to hit the airwaves during that time of year. Something we could listen to from start-to-finish rather than on a song-by-song basis. So, that's how the album was born – out of necessity!" 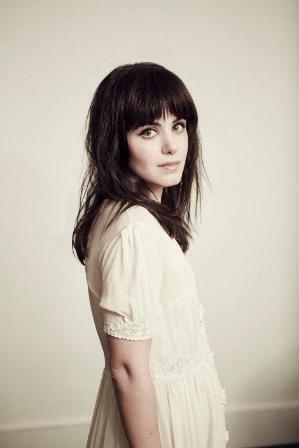 Katie released her debut album, Call Off The Search, in 2003. Since then she has released five studio albums including 2013's Ketevan which is her birth name. With a clear idea on how In Winter needed to sound, in late 2015 Katie and engineer Adam 'Cecil' Bartlett flew to Georgia with twelve boxes of equipment and built a DIY studio in the small town of Gori's cultural community centre. Admits Katie: "There were many unknowns: we weren't established producers; we were building a studio; the choir had never recorded with headphones; Cecil didn't speak a word of Georgian and could I effectively communicate to the choir how I wanted this record to sound?" With the studio built, the choir, with their conductor, Teona Tsiramua, and their vocal professor, former opera singer Anzori Shomakhia, on hand, recording began. One of the first songs recorded was the album's opening track The Little Swallow (Shchedryk), a traditional Ukrainian carol first arranged by Mykola Leontovych in 1916 and subsequently adapted for the West as Carol Of The Bells. On Joni Mitchell's River, Katie's acoustic guitar provides a minimalist backdrop for the swell of voices. 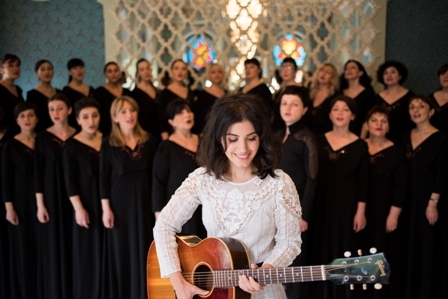 Perfect World, the first new song written by Katie since the release of her last studio album, was brought to life with the addition of the choir. Nunc Dimittis from Rachmaninoff's All-Night Vigil, written two years before the Russian Revolution in 1917, was a challenge to record but was a piece that was central to Katie's vision for the record. "I had to have it on the album; it took me close to the mythical notion I have from my youth of the Russian forest, frozen and covered in snow, and of my Granddad's tales of escaping from a Siberian labour camp." With the four songs recorded, Katie returned to London and spent the next six months researching the album's remaining songs, while continuing to write new material, the abiding theme being winter and the deeply personal feelings elicited by this particular season. In April 2016 Katie and Cecil returned to Gori, rebuilt the studio, and for the next four weeks immersed themselves in the recording. The album reflects Katie's dual culture. The melody of the Romanian carol Leganelul Lui Lisus (Cradle Song), led her to write Plane Song on which she recalls playing with her brother in old, rusty Soviet aircraft littered across various fields in Georgia after the civil war. A Time To Buy is both literal – the commercialism of Christmas, overwhelming (particularly to a young Katie arriving in the West) yet joyful – and allegorical – the self-judgement, anxiety and fears of the 'have-it-all' woman. Tu Ase Turpa or If You Are So Beautiful is a modern folk song and the only Georgian song on the album. Dreams On Fire, the first single, continues the theme of love, and is co-written with one of England's songwriting greats, Don Black. "I feel the stillness of the winter season really causes us to reflect on our lives and relationships, wondering if our loved ones share the same feelings when it comes to growth and the fear of change. I consider Don Black a master of lyric writing, and the words in this song sit right at the heart of a lover's insecurity." The video features Katie and choir members performing in the historic Georgian National Opera and Ballet Theatre of Tbilisi which reopened in January 2016 after a multi-million pound refurbishment. Speaking about the choice of venue Katie explains: "In 2014, during the renovations, I was shown round the theatre by Zurab Lomidze who was director of the opera house in 1991 at the time of the civil war. In many ways the theatre symbolises a new phase for the country. The beauty and opulence of the building was at odds with my childhood memories of Tbilisi and it gave me a great sense of hope for the country's future, that a place of art and culture has been so lovingly restored." The album closes with a delicate and restrained performance of O Holy Night, a carol that Katie performed at her first school carol concert in Belfast. With the recording complete, Katie wanted the artwork to represent the magical winter wonderland in her imagination. On a trip to her local bookshop she discovered the work of London-based Thai illustrator Niroot Puttapipat who has illustrated such notable book titles as The Nutcracker, The Rubáiyát of Omar Khattám, and Jane Austen's Emma. Puttapipat is responsible for the album's cover art, as well as the illustrations within the physical albums. Dec 3: Glasgow, Old Fruitmarket.